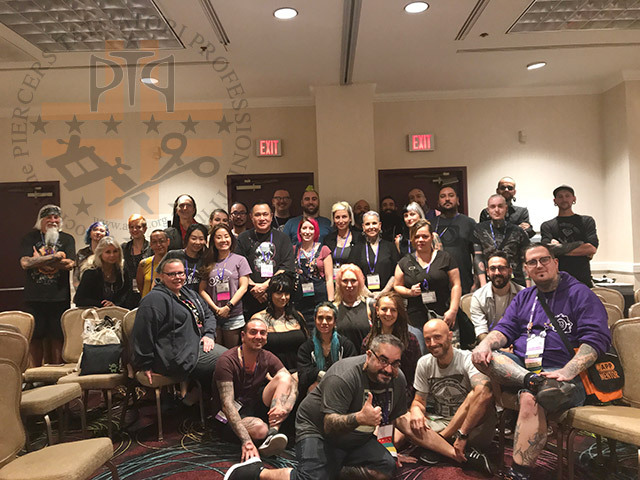 Returned from the 23rd edition of the International Conference for Piercers, organized, as usual, in Las Vegas by APP (Association for Professionals Piercers) we would like to bring back some ideas. This year our participation was short but intense. First important thing to emphasize is the number of participants, which has reached the considerable number of more than 1100 piercers from all over the world. 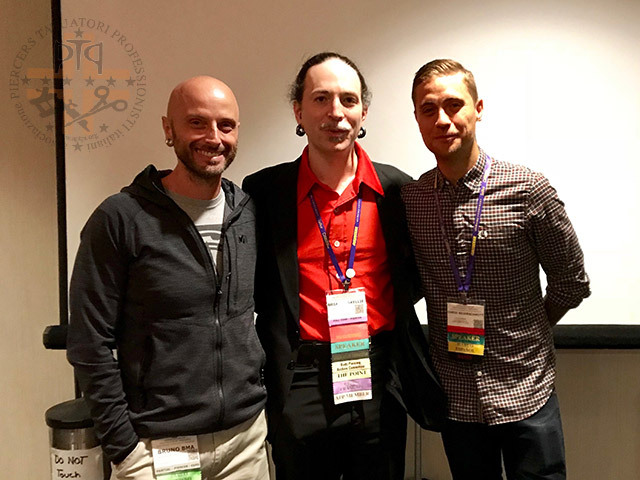 As APTPI, following the APP from 2003, we have seen how this event has grown exponentially over the past 5 years. With great pleasure we assist and participate in the considerable increase in sensitivity towards an increasingly professional preparation by the operators of the sector. An example of this is the International round table held during the conference days. Operators of 15 nationalities participated in this event. It was extremely interesting to hear the different realities that everyone is experiencing from the professional point of view. A lot of initiatives of spontaneous aggregation by the operators of the sector are being created in every part of the globe, but mostly in our European reality. England and Spain, already for 3 years, have founded a national association and have organized the first conferences for Piercers. The same is happening in South America. Even Italy, however, beyond our project APTPI, is taking the first steps to this effect. 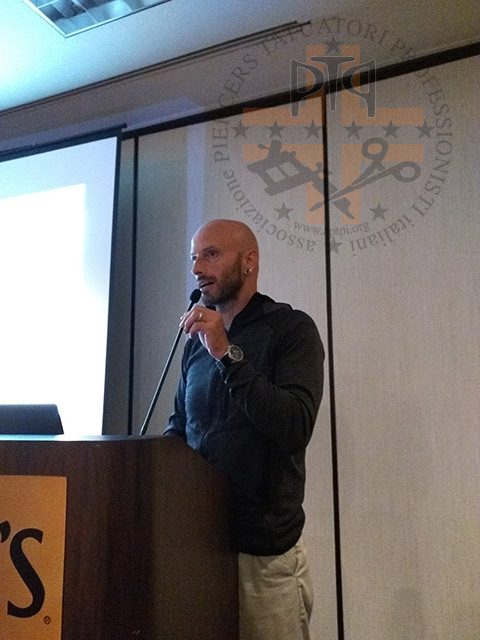 There was a first meeting of Piercers last February, organized in Rome, during which it was expressed the interest to create an associative reality for piercers only. Very positive also the intervention of our English colleagues who have updated us on the fact that something is moving, from a legislative point of view, on local legislation that prohibits and demonizes female genital piercings. The last news, but not least, is that, with the beginning of 2019, a unified regulation on the activity of Body Piercing should be issued by the European Community. Unfortunately, for the moment they are just rumors, even if authoritative. We have not yet got to read the document in circulation, but as soon as we have some news, we will not fail to publish the update Returning to the conference just finished, we participated in the round table organized by I.S.A. (International Suspension Alliance), which we also are part of since the foundation. The current breaches have updated us on the progress of the Association, on the various initiatives in place, on projects and objectives in the short and long term, on the positive increase of new members and on unpleasant events in the USA in some Suspension groups. 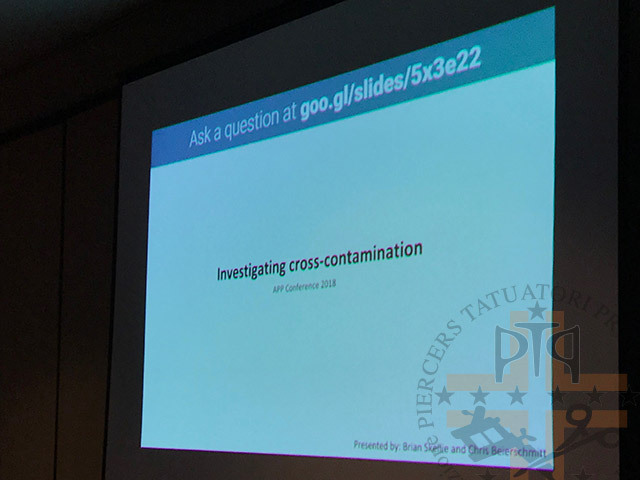 Another interesting and pleasant moment was the participation, as co-rapporteur, together with Brian Skellie and Chris B., of our Bruno Valsecchi, during the “investigating cross-contamination” class: this presentation was offered for the first time this year to just APP members. Interesting experiments have been proposed with consequent scientific evaluations on contaminations, as well as practical tests. Due to the interest shown, it seems that next year we should be able to propose a deepening both theoretical and practical, thus giving the possibility to the participants to be able to evaluate live the effectiveness of their work. during the exhibition “The Perforated Body: an exploration of piercing in performance “. A pleasant and intimate moment that saw also present Jim Ward and Paul King. We conclude by thanking the APP and see you next year.